Discover the walking / hiking trails through Slovenia's Julian Alps, Triglav National Park, Karavanke Mountains on the Austrian Border, Poclujka, and the Kranska Gora area. The scenery is stunningly beautiful of the mountains, valleys, deep gorges, and the alpine meadows covered with wildflowers along the edge of rushing rivers and glacially formed lakes. Superb walking in the Julian Alps with stunning views at every turn! Discover Slovenia’s Julian Alps, Triglav National Park, Karavanke Mountains on the Austrian Border, Poclujka, and the Kranska Gora area where there is plenty to offer every level of walking. Slovenia lies south of Austria and Italy and our walking is in the north of the country based near Lake Bohinj, the largest of the Slovenian lakes. There are picturesque villages with farming at the heart of the economy. 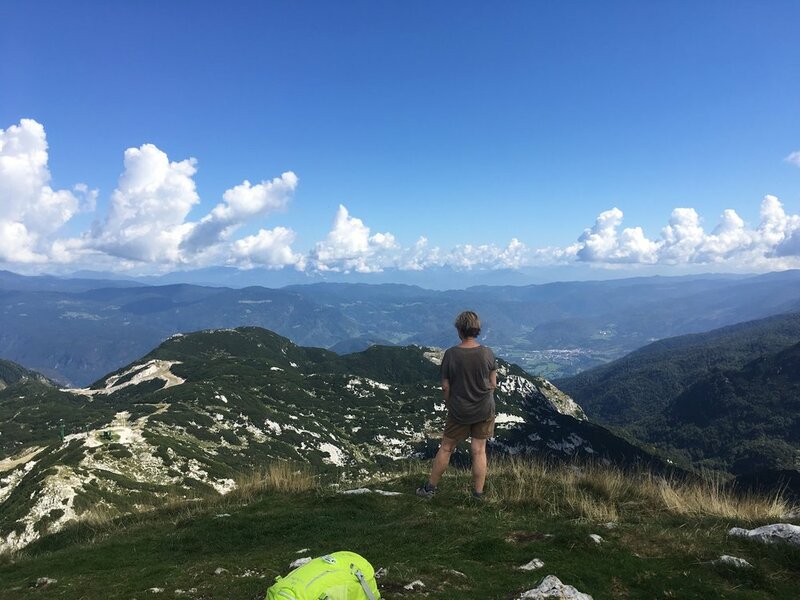 The scenery is simply stunning on the walks with views of the rocky crags of the Julian Alps and below, the valleys, lakes and meadows offer a tranquil contrast - a walker's delight. Hospitality of the local people, always welcoming, complement this superb walking destination. Walking is available from May to October in these mountains with the ideal temperatures in late spring and late summer. Join us in exploring this Alpine region where walking is a national tradition. We are based in the Bohinj region, an ideal setting for exploring the beautiful mountains, gorges, alpine meadows and pristine lakes of northwestern Slovenia. We walk five days and have a free day to do as you please from our center base in Bohinjska Bistrica. We are based in Bohinjska Bistrica, a charming and quiet village where we stay in the Hotel Tripic, a family run 3-star hotel. It is located 3 miles from Lake Bohinj, Slovenia’s largest lake and is a comfortable setting for our walking holiday. The village is the center for rural life in the upper Bohinj Valley and has a number of supermarkets, restaurants, bars, a pharmacy and a fitness and swimming center. The rivers Bistrica and Sava meet here. All rooms are en-suite, and include a hairdryer, flat screen cable TV, balcony and wardrobe closet. Wi-Fi is available throughout the hotel and is free of charge. There are two restaurants, a bar, and an outdoor lounge and eating area. There is a wellness center and spa nearby and hotel guests are given a discount. Breakfast is self-serve, offering a wide range of traditional dishes including cheese, ham, yogurts, vegetables, fruits, nuts, breads, juices, coffee and tea. Our lunches are eaten on the trail, usually at mountain huts where they serve rustic soups, goulashes and bread as well as the traditional strudels. There is not a wide variety of choice but it is hearty; you may decide to supplement this with your own purchases from the village bakery. It is a great opportunity to sample Slovenia cuisine through experiencing their regional specialties. Dinner each night is in Hotel Tripic’s restaurant featuring a salad bar, starters, entrees and desserts. Dinner is taken from the full menu and there is a wide range of offerings including vegetarian, beef, port, chicken and locally caught trout. As we are close to the Italian border, pizza and pasta are always available. The hotel has a bar close to the restaurant and beer and wine is good and inexpensive. If the weather is warm at night, we may opt to eat in the outside restaurant. Accommodations en-suite for seven (7) nights (based on double occupancy). Breakfast each morning as part of your hotel accommodations. Three-course dinners for all seven (7) nights. Transfers between the hotel and the airport in Ljubljana on arrival and return transfer upon departure. Transport to and from each day’s walk. Full program of guided walks with experienced tour leaders and professional local guides. This is a land only holiday so your flight to and from Slovenia is not included. We are happy to assist you with providing flight information from your local airport. There is a single supplement of approximately $225 for the 7 nights and will be quoted at the time of booking. The spectacular Julian Alps are predominantly limestone and their jagged form produce stunning vistas wherever you look. Walkers from around the globe have discovered Slovenia's dramatic and lovely landscapes of mountains, forests, meadows, and lakes in which to walk and there are walks to suit all levels from the challenging ascent of Mount Triglav to the easier and gentler walks through Vintgar Gorge. There are beautiful glacial lakes, rushing rivers, impressively deep gorges, underground caves – typical to limestone alpine scenery - and meadows with a splash of wildflower color are everywhere. All Slovenia holidays have two grades of walking – moderate and easy. 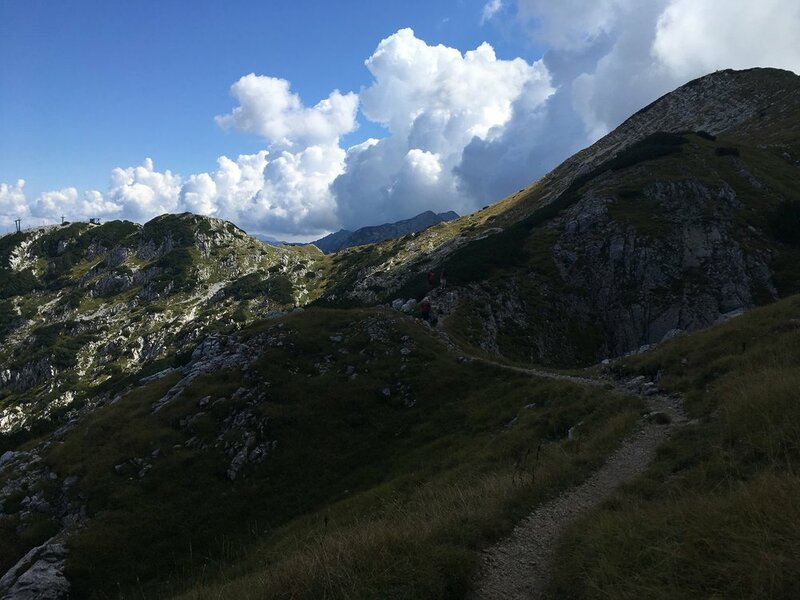 We walk in the Julian Alps, Triglav National Park, Karavanke Mountains on the Austrian Border, Poclujka, and the Kranska Gora area. Additional details on the walks are furnished below. You will have the choice each morning to select the grade that you want to walk that day. Pace on all walks is not rushed – there is time to look around, rest and take in the countryside. Whichever walking level you choose, you are guaranteed an invigorating experience and beautiful views. Moderate grade: Distances 7 to 9 miles a day, ascend and descend at least once per day up to 300 meters (1,000 feet) but generally over an hour and a half – no rush – there is too much to see. Easy grade: Distances 5 to 6 miles and may include sightseeing in villages and areas of interest including the scenic lakes of Bled and Bohinj. Walks are not as fast with plenty of stops. There will be hills to ascend and descend but are taken at a leisurely pace – never rushed – more of a stroll. 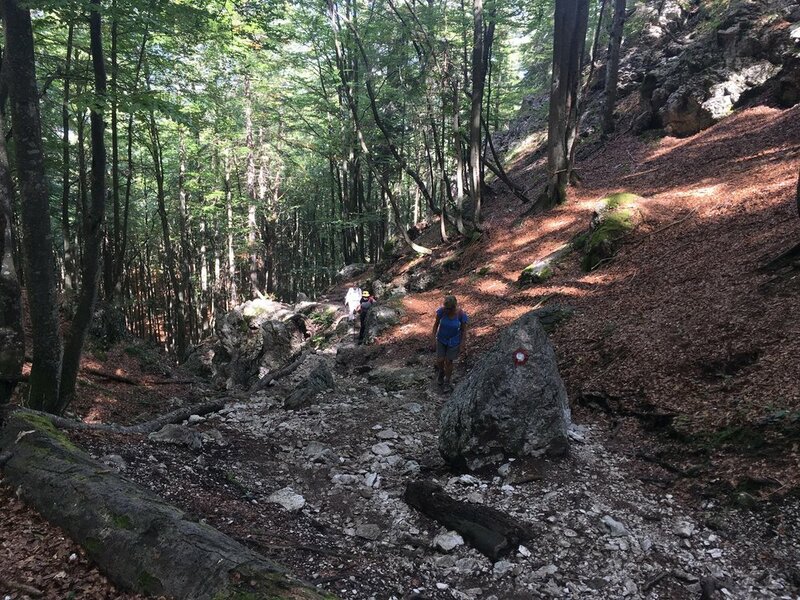 Terrain: Conditions vary in Slovenia – green pathways, stony (limestone country), loose stones, tree roots on many paths and care is taken in these sections. Climbs: Climbing in the moderate grade is steady with the occasional steep short stretch but there is never a rush and downhills are … well downhills – some find that walking poles help cushion the knee in particular on the downhill sections. Walk duration: We take a mini bus ride to the trail head and walks are usually 5.5 hours, returning by 16:30 (4:30PM). There will be time for relaxing before dinner in the hotel’s restaurant. Vogel ski lift and Rodica Mountain: We take the gondola to the Vogel Ski resort, then a chair lift before ascending Sija Mountain to approximately 1,800 metres (5,900 feet). 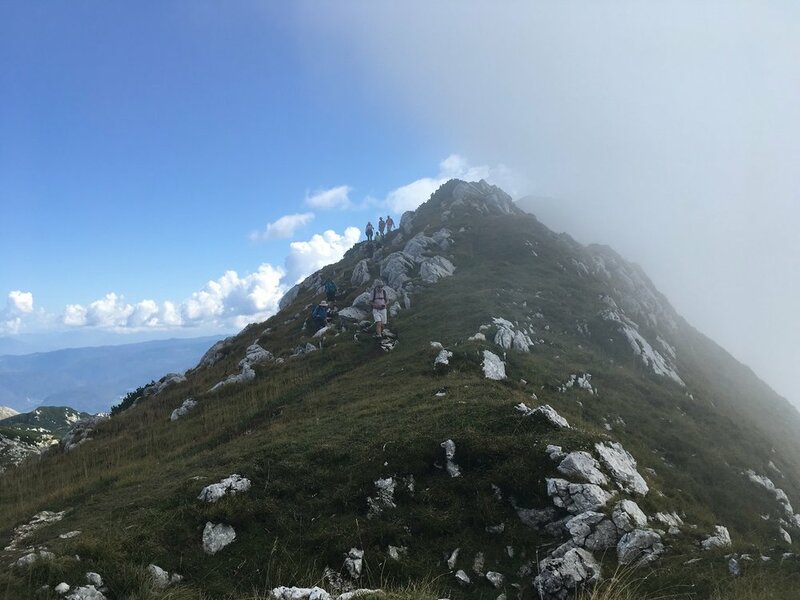 Continue on to Rodica Mountain along a superb ridge with views to the Adriatic as well as deep into the Triglav National Park and the Julian Alps. We return a slightly different way to the gondola and transport back to the hotel. 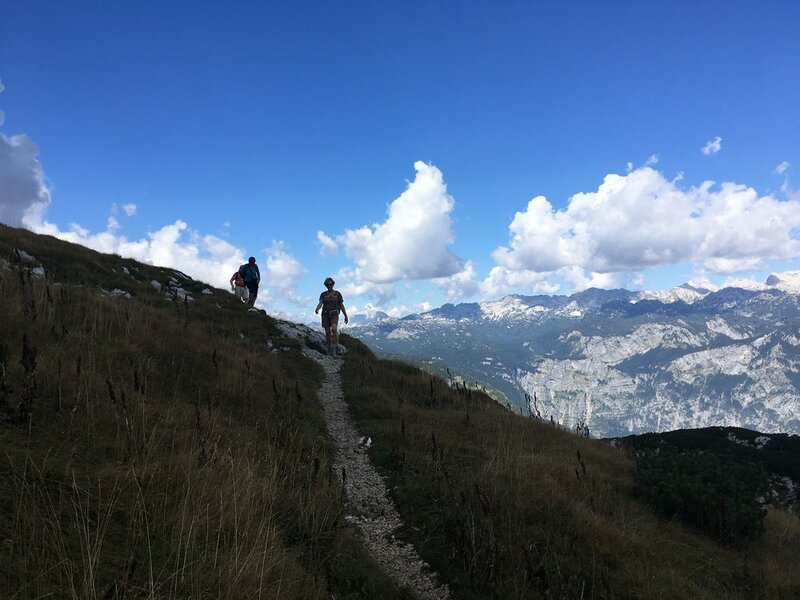 Dependent on the ability of the group, we may only ascend Sija and on our return after lunch into the Sava valley we walk round the east side of Lake Bohinj, a lovely lake side walk. Prsivec Mountain and the hills above Lake Bohinj: Starting at Blato, we ascend through forests to the lovely mountain hut Pl Visevnik beside a small lake for coffee. We then ascend again to the superb viewpoint over the Bohinj Lake and the Lower Bohinj range of mountains at Prsivec. We return to the hut for lunch then descend back to Blato on a different path for transport pick up. Mount Brda and Debela Pec: Transport to the walk start at Pockluka meadows from which we ascend through forest and meadows to the Lipanca Mountain hut. After a coffee, we ascend Mount Brda (2009 metres/6590 feet) and Debela Pec (2015 metres/6610 feet) which is an ascent from the hut of 250 metres (820 feet). We wind our way down to Lipanca hut for lunch and descend through the forest after lunch to our original starting point. Vintgar Gorge circular and Lake Bled: We walk through meadows from Bled town through lovely villages to the start of Vintgar Gorge. The Vintgar Gorge carves its way through the vertical rocks and the walk is awe-inspiring – then continue to St Katerinas church. Continue along a meadow path back to the start of the gorge and descend to lunch in Bled town. In the afternoon, we walk around Lake Bled on its eastern side to view the church on the island, Vila Bled, Tito's summer home, and Mlino for transport back to the hotel. Under the Špik Mountain the spectacular Upper and Lower Martuljek waterfalls: Transport to this deep valley and ascend over wooden bridges and many steps to two waterfalls. Coffee at a magnificent hut under Spik mountain and eventually ascend to the highest waterfall. Return to hut for lunch, then back to minibus and a visit to Kranska Gora. 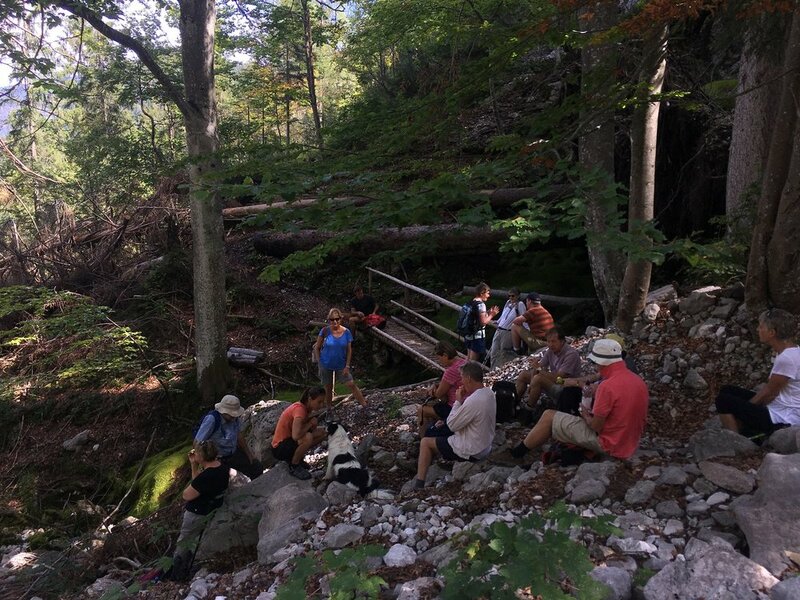 Mostnice Gorge and Voje Meadows: We start at Ribcev Laz and walk alongside Bohinj Lake to the Mostnice Gorge and continue through this magical deep gorge and out into the Voje meadows to the Mostnica Waterfall. Lunch at a lovely mountain hut, and descend to Stara Fuzina and transport back to the hotel. 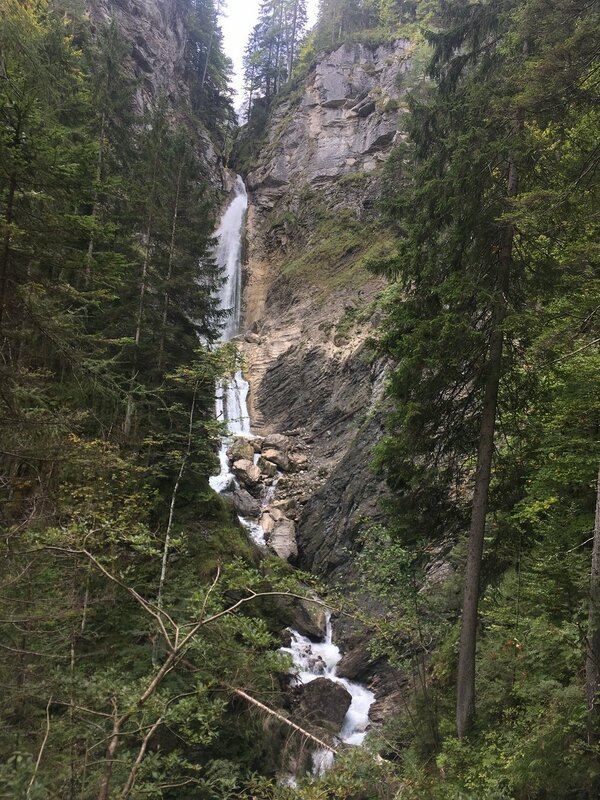 The Barons Walk: The walk is to the Austrian border and through small tunnels and woodland to our coffee stop. Then ascend a little higher underneath the Karavanke range of mountains and down through a superb limestone valley for a late lunch, then on to look at Grad castle in the rocks. Sava River trail: Starting at our hotel we walk to Brod along the Sava River cycle path and then over the hill to Rudnica viewpoint and then Pec before descending into Stara Fuzina village for lunch. Under Studor mountain to Srednja Vas, and over the hill back to Bohinj Bistrica in the Sava Valley. Slovenia is a small country located in central Europe and shares borders with Hungary, Austria, Croatia and Italy. Comprised primarily of mountains and meadows, it is the convergence of the Carpathian Basin, the Adriatic Sea, the Alps and the Dinaric Mountains which sets the stage for diverse flora, fauna and landscapes. Slovenia is a member of NATO and joined the European Union in 2004. Slovenia’s attractions include the magnificent Julian Alps and Triglav National Park, Lake Bled, Bohinj, the Kamniske Savinje Alps, the Soca Valley, Logarska Dolina alpine valley, the Adriatic coastline, and below ground with over 7,000 caves including the Postojina Caves and the Skocjan Caves. There are plenty of museums as well, ancient monasteries, Gothic frescoes, hundreds of castles scattered throughout and even hot water spas. Bohinj Bistrica, where we are based, is a village in Bohinj, a region known for its natural beauty and is an ideal location for visitors to explore the Julian Alps and Triglav National Park. The Bohinj region is the result of a basin formed by a glacier and is flanked on three sides by the Julian Alps. There is a lovely lake which can be explored (and is actually bigger than the more famous Lake Bled). Ljubljana is the capital of Slovenia and is a delightful city to visit to get a feel for the Slovenian culture. Nearby Lake Bled, one of the more famous glacial and tectonic lakes, is a picturesque village and offers the visitor a bit of history, relaxation and is lovely to walk around. The country has a proud reputation for cleanliness, and self-sufficiency - you will find many small allotments for vegetable and fruit growing in most gardens. The Slovenes are a welcoming people, friendly and outgoing. They want you to explore their superb countryside. Walking is a national hobby - why wouldn’t it be when there is so much grand scenery to explore. Their other national pastime is eating - and they have excellent Slovenian wine. The Slovenian people will welcome you to their magnificent country - rest assured. Getting to the Slovenia holiday. The price for this holiday is land only and does not include flights from the United States to Slovenia. We can help research your options for arranging travel to Ljubljana's Joze Pucnik Airport or optionally to Venice's Marco Polo Airport in Italy. Our hotel is a 45 minute drive from the airport in Ljubljana. Alternatively, transfer between Venice and your hotel in Bohinj Bistrica will take between 2 and 3 hours and there will be a transfer supplement but may end up being a less expensive alternative as more airlines fly into Venice. Airfare may cost between $700 and $1,400 round trip between the United States and either Ljubljana or Venice, depending on where your flight originates, the time of year and when you make your booking. Budget airlines from several European capitals may offer a better price if you are adding onto a trip to other parts of Europe or are booking separate airlines to a major city. For instance, from London area airports the round trip price is anywhere between $120 and $200 nonstop -- only a 2 hour flight. When scheduling your flights, keep in mind that it is ideal to arrive by mid-afternoon or early evening if possible to allow yourself a bit of time to relax. Please note that the published holiday dates are the dates you arrive in your holiday area and not when you leave the United States. Extra days or nights. If you are interested in adding any extra days and nights to your holiday to explore more of Slovenia, and you would like our help, please let us know. Passport and Visa Requirements for U.S. Citizens. Passports must be valid for at least three (3) months beyond the period of intended stay and issued within the past ten (10) years. It is further recommended that your passport have at least six (6) months validity remaining beyond the date of completion of the holiday and ensure there a sufficient number of blank pages in your passport (usually 4 to 6). No Visa is required for stays under 90 days within each 180-day period. Please consult the U.S. Department of State’s website for the most current country requirements. Weather. Temperatures in the spring and autumn average in the 70s during the day and 50s at night, making for an ideal walking climate. Official language. Slovene is the official language and English is spoken in the larger cities and at tourist locations. Starting Location: Ljubljana Airport pickup and transfer to the hotel. Ending Location: Ljubljana Airport drop off at the departures terminal at the end of the holiday.